And hence we get "veteran". Veterum Sapientia, soon-to-be St. John XXIII's yet-to-be-heeded Apostolic Constitution. That's the "Sixties" we who have the "Vetus" sensibility should reclaim. The E is short, so it should sound more like the E in wet or pet or get. As in VET? Veteran, vet, vetted etc. Vetus Ordo. I like it, hope it catches on. 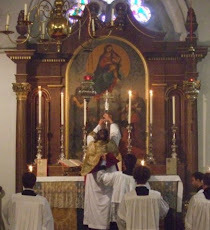 Father John, would you consider the new Ordinariate Liturgy of Divine Worship to be more Vetus Ordo rather than Novus Ordo? Depends. If you chose one set of options and sympathetic ceremonial, it would look very vetus. But it would be equally possible to opt otherwise and give it a quite different appearance.